As I grow older, Thanksgiving is quickly becoming one of my favourite holidays. It's a long weekend dedicated to cooking and baking, eating and drinking, cuddling and chatting, staying warm and giving thanks. There are no decor expectations or gift giving stresses, no shopping frenzies or mandatory family traditions. At least in my family, Thanksgiving sort of slips under the radar. We've always had wonderful weekends together, but our celebrations have evolved with the passing years. Lately, Chris and I have been spending the holiday in probably the best way possible for a couple of newlyweds, it's just the two of us and we cook, eat and hang around the house, staying indoors for as many days in a row as possible. It's exceptionally wonderful! 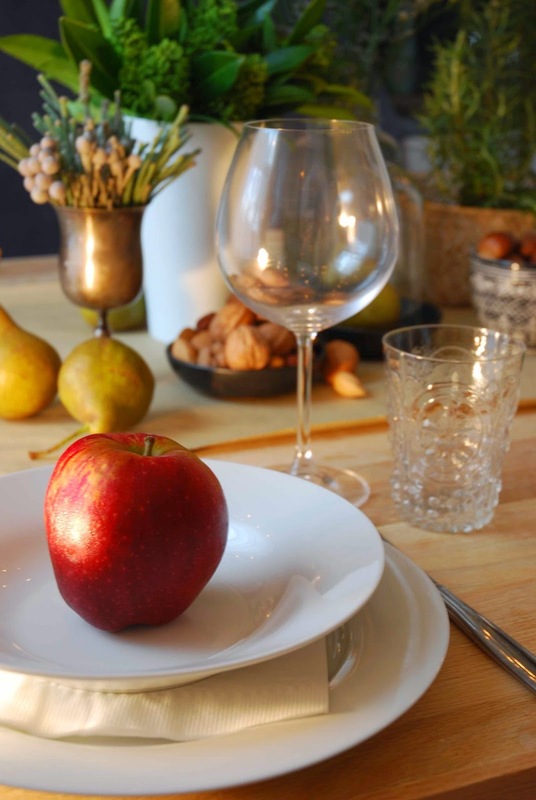 This year our menu includes cornish hens, clam chowder, pastry wrapped pork tenderloin, whipped potatoes, roast cauliflower, caramel apples and maybe even apple fritters! 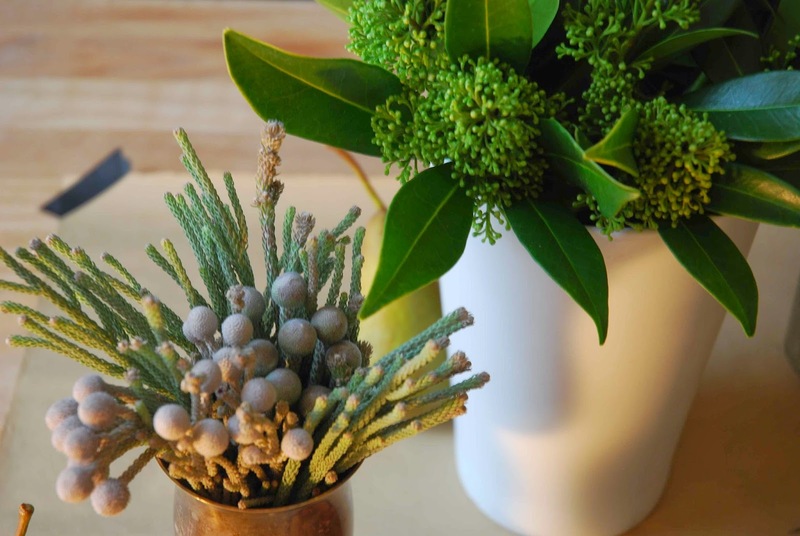 Even though it's just the two of us, I'll be making sure the house feels and looks festive, after all, it takes more than the smell of roasting poultry to get in the spirit of things! Okay, maybe that's not true, but a few flowers and decorations never hurt! And as you know, I love to decorate for a holiday, but Thanksgiving (actually any autumn theme) presents a unique challenge for me, as I don't really tend towards the typical fall colours. I like to see the leaves changing of course, but bringing all that red, orange, brown and golden yellow into my home? No thanks. I'm going to have to skip the orange dollar store leaf garland. And I don't think I'm alone in this search for crisp, chic, and even modern fall decor. 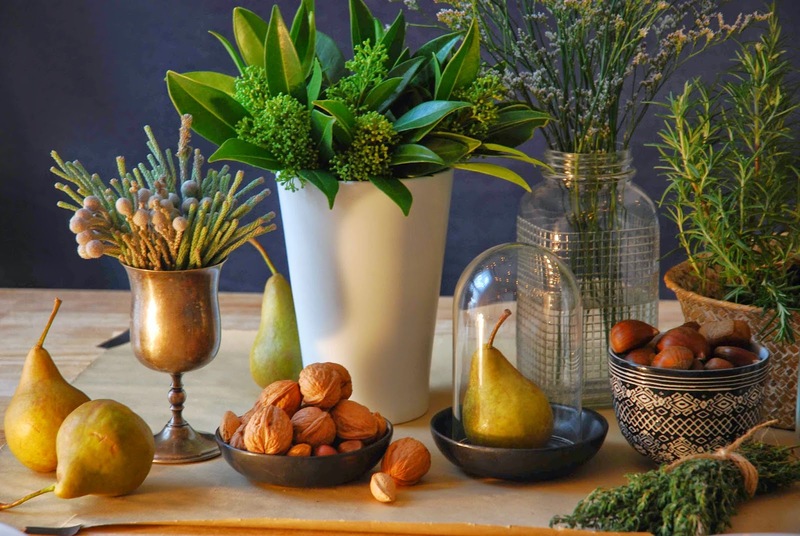 So many of us have painted our homes with bright whites and greys, so what kind of festive decor says fall, but still compliments those cool interiors? Well, today I'm focusing on setting the table. A 'tablescape' doesn't have to cost a lot of money or involve at bunch of random dollar store purchases. 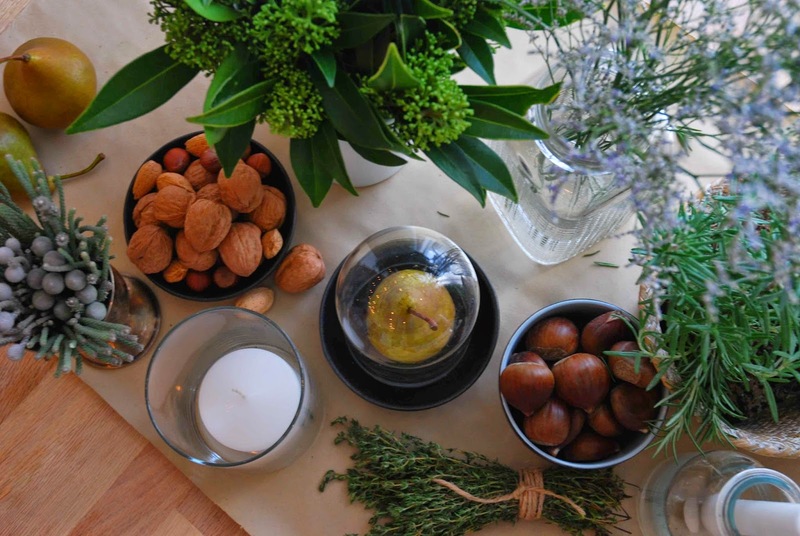 Here are a few brief ideas from my Thanksgiving table, I hope you'll find it stylish, original and even autumn appropriate. Start with fall flowers. I played with a palette of greens, greys, and lavender. Layer in fall fruits like apples, figs and pears. Mix in some mixed metals. 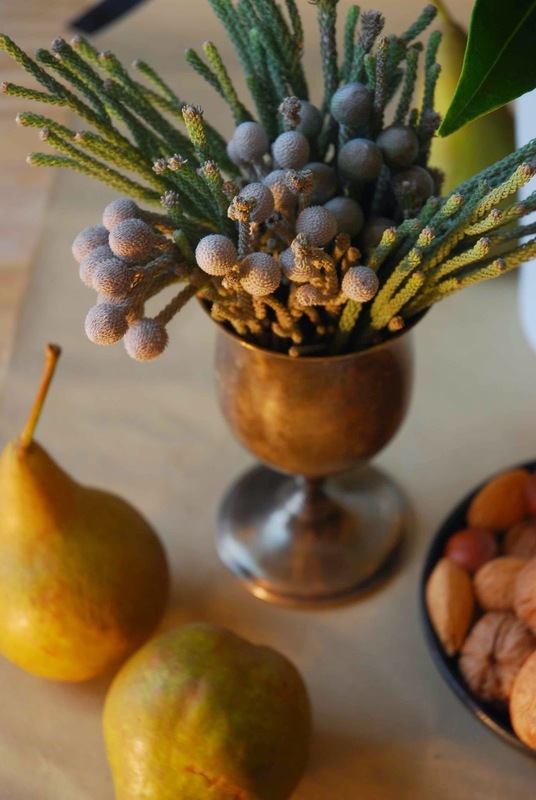 I love the way antique brass and tarnished silver look on an autumn table. 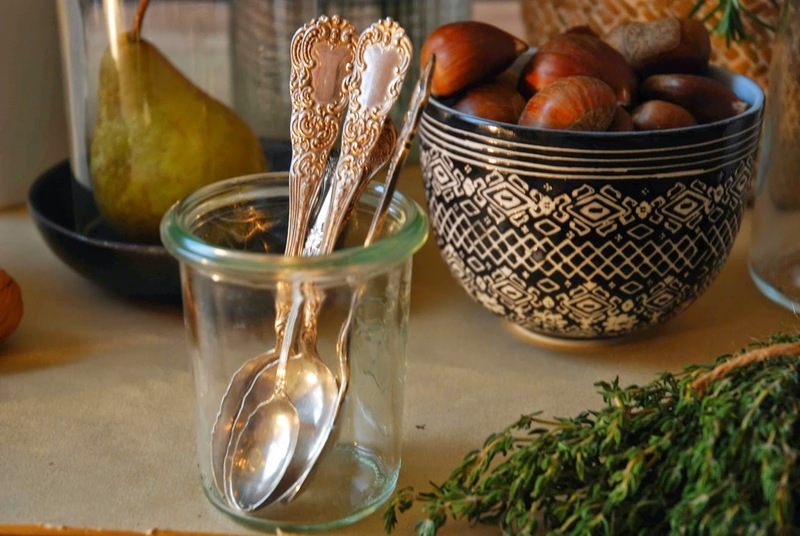 If you have real silver flatware, this is the time to show it off! I found a pair of old silver goblets at Value Village (where else? ); this one works well as a small vase. Bundle grocery store herbs with a bit of twine for a rustic look. 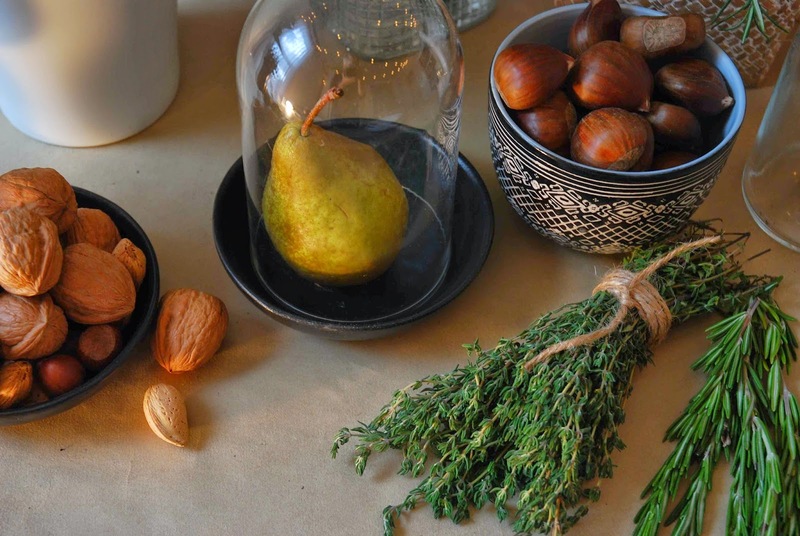 Assorted nuts in clay bowls are an inexpensive and tactile way to continue the easy organic theme. 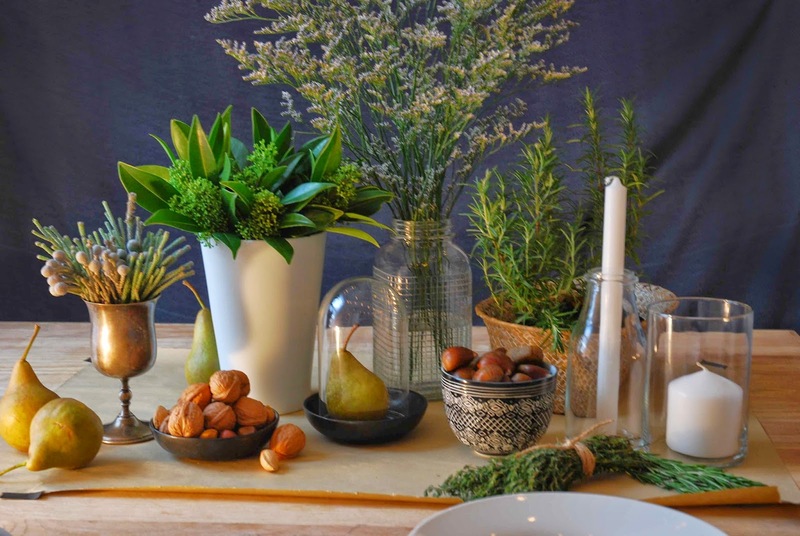 Pot herbs in a basket for added texture and a wonderful festive scent (think, rosemary, sage and thyme). 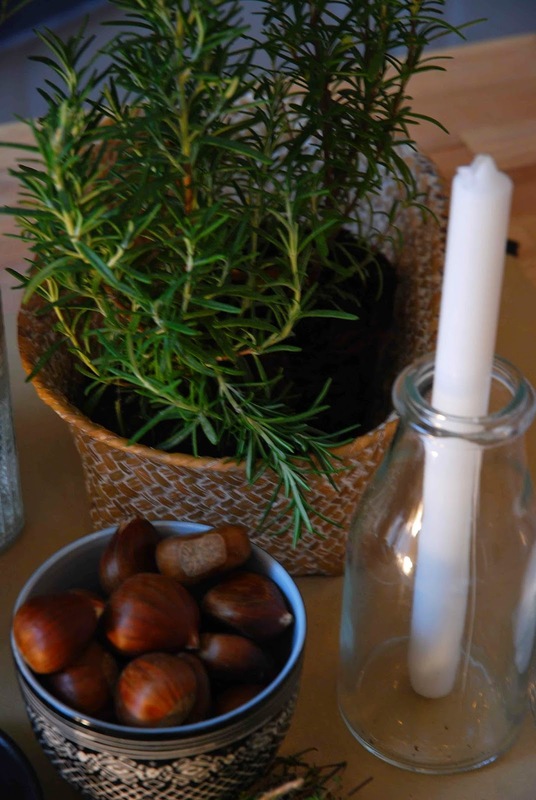 White candles in clear glass containers provide warm light and classic style. And as I have said before, a bell jar is never out of place! They look timeless and lovely, and instantly elevate ordinary objects.